Angela M. Debartolo., et al.Training Program Implemented to Empower the Faculty and Student’s Learning the Current CAD/CAM Technology. (2015) J Dent & Oral Care 1(3): 1-3. © 2015 Angela M. Debartolo. This is an Open access article distributed under the terms of Creative Commons Attribution 4.0 International License. CAD/CAM Technology; Digital impression, Design modification and Milling of the restoration. The purpose of this educational program was to instruct faculty doctors on the new software to be competent in order to guide the student dentists in taking digital impressions and design restorations using CAD/CAM technology. At New York University College of Dentistry doctor(NYUCD) we have been using CEREC® CAD/CAM technology for more than two and half decades. For the use of the new Blue Light LED CAD/CAM faculty training was necessary. Therefore a new educational program was implemented where each faculty doctor was required to prepare and design an inlay, an onlay and a crown utilizing the two different modes of Biogeneric Individual mode and Biogeneric Copy mode. A well trained faculty doctor was able to finish the above requirement in two days of sessions and therefore certified to utilize the system in their respective group practice. The uncertified faculty doctors were required to do five indirect cases with their students under the supervision of the quality control faculty doctor. The student dentists were required to prepare a tooth under the supervision of their faculty doctor. In addition, the student dentist had to take and pour up both an upper and lower impressions under the guidance of the quality control faculty doctor. The student dentist also performed all required steps such as digital impression, design, modification, and milling of the restoration. In September 1985, CEREC® by Sirona Dental Systems was used to make the first chairside ceramic restoration at the University of Zurich Dental School. Since then subsequent computer- aided design/ computer – aided manufacturing (CAD/ CAM) systems have become available and both hardware and software have been improved.3 Through the use of CAD/ CAM technology, many steps of the traditional process of fabricating an indirect restoration are eliminated while allowing a restoration to be created chairside. All acquisition units are mobile and contain a camera, a computer, screen and keyboard. The acquisition unit transmits wirelessly to the milling chamber if maintained within one hundred feet of the milling chamber. Recently NYUCD upgraded to CEREC’s® Blue Light LED CAD/ CAM technology. Instead of laser or infrared red light source, Blue Light technology uses blue light’s short wavelengths to capture a set of measurements which are combined to generate a digital impression. In order to fully integrate the new CEREC® technology a training program was essential for both faculty and student dentists. The training program comprised of different requirements for faculty doctors and student dentists. Each faculty doctor was required to prepare and design an inlay, an onlay, and a crown utilizing the two different modes of making digital impressions: Biogeneric Individual mode and Biogeneric Copy mode (Figure 1). As a NYUCD protocol when adding new cases we enter the student’s initials under the “Patient’s name” and under “Patient’s ID” we enter the student’s initials and the tooth number that will be receiving the restoration. This method ensures that the cases are tracked correctly while maintaining patient confidentiality. When using the Biogeneric Copy mode a direct technique is utilized and the restoration can be milled and inserted in one visit. The Biogeneric Copy mode entails that two digital impressions are taken intraorally. The initial digital impression is taken before the preparation and second digital impression is taken after the preparation is completed under rubber dam. Biogeneric Copy mode is utilized exclusively for inlays and onlays. Biogeneric Individual mode(- Figure 2) is an indirect technique that requires two visits and is used for onlays, inlays and ceramic crowns. Ceramic crowns are done exclusively on cuspids and bicuspids. At the first visit the tooth will be prepared and conventional impressions are taken of the preparation and the opposing dentition and subsequently poured using Die Keen stone. Digital impressions are taken of the upper and lower quadrant of the previously poured Die Keen casts. Usually three to five digital impressions are taken of each quadrant. A single digital impression is then taken of the buccal view in centric occlusion. Once the digital impressions are taken using either Biogeneric Individual or Biogeneric Copy mode, one can proceed to design and fabricate a restoration. Figure 1: Biogeneric Copy mode. Digital impressions taken and designing tools used to create an onlay on tooth #30. Figure 2: Biogeneric Individual mode. Digital impressions taken followed by utilization of designing tools to create an onlay restoration on tooth #19. At NYUCD well trained faculty (Figure 3) completed the two day requirement for standardization and therefore were qualified to operate the system in their respective group practice. The uncertified faculty doctors were required to do five indirect cases with their students under the supervision of the quality control faculty[2,3]. The student doctors were required to prepare a tooth under the supervision of their faculty doctor. In addition, the student doctors had to take and pour up both an upper and lower impression under the guidance of the quality control faculty. The student doctors performed all required steps such as digital impression, design, modification, and milling the restorations. Currently NYUCD uses Sirona’s CEREC® or Henry Schein’s E4D® for chairside restorations[4,5]. Faculty and students were trained on Sirona’s CEREC® CAD/ CAM. 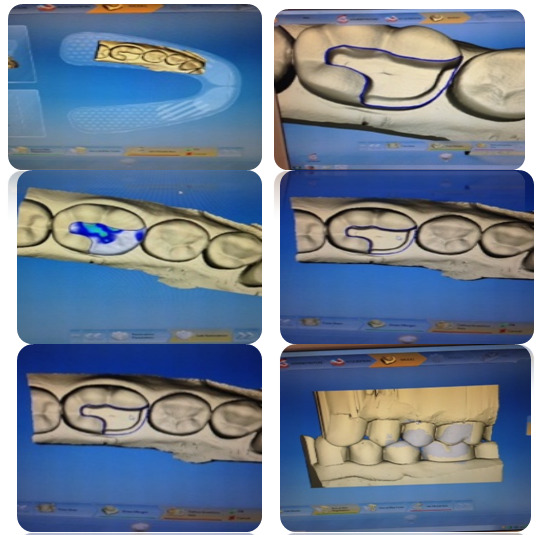 Although the training program was successful, it is an educational foundation that focuses on Biogeneric Copy mode and Biogeneric Individual mode for fabrication of inlays, onlays and crowns CAD/CAM technology has many other capabilities that are explored in the private office setting that are not used within NYUCD’s educational setting. A feature that is not used at NYUCD but is often used in the private office setting is called Biogeneric Reference. This is when the occlusal anatomy cannot be captured and used from the tooth that will be prepared and restored but is captured from a reference tooth, the same tooth on the opposite side of the arch. For example a preparation and fabrication of a restoration, whether be an inlay, onlay, or crown, is to be made on tooth # 19, the occlusal anatomy could be captured and used from tooth # 30, making tooth #30 a reference tooth for the fabrication of the restoration mirror imaged on tooth #19.Currently at NYUCD we use CAD/ CAM technology to fabricate inlays, onlays for premolars and molars and crowns for premolars. Again CAD/ CAM technology has many capabilities and can be used for the fabrication of many different types of restorations, including but not limited to veneers, three unit fixed partial dentures, implant crowns, and whole arch restorations. At NYUCD we currently use CAD/ CAM acquisition units that use CEREC® Optispray®, under rubber dam to capture a digital impression. For novice faculty and students determining the correct amount of titanium dioxide can be challenging and usually leads to an overuse of the spray which will cause an inaccurate digital impression. However when used properly, the titanium dioxide spray yields a well-defined virtual impression. Recently new CAD/ CAM acquisition units were introduced, such as CEREC® Omnicam® , which are powderless, meaning they no longer use CEREC® Optispray®, a titanium dioxide spray, to capture a digital impressions. Investing the time to produce and execute this educational program created at least two proficient faculty doctors in each group practice and a generation of NYUCD student dentists that are proficient in using Blue Light CAD/CAM technology. 1. Rekow, D.E. Dental CAD/CAM systems: A 20-year success story. (2006)JADA137(1):5S- 6S. 2. Neiatidanesh, F., Amjadi, M.,Akouchekian, M., et al. Clinical Performance of CEREC AC Bluecamconservative ceramic restorations after Five Years- A retrospective study. (2015) Journal of Dentistry. 3. Poticny, D.J., Klim, J. CAD/CAM In-office Technology, Innovations After 25 Years for Predictable, Esthetic Outcomes. (2010)JADA 141(Suppl2): 5S- 9S. 4. Allen, K.L., Schenkel, A.B., Estafan. D.An Overview of the CEREC 3D CAD/CAM System. (2004)Gen Dent52(3): 234- 235. 5. Fasbinder, D.J. Clinical performance of chairside CAD/CAM restorations. (2006) J Am Dent 137Supp: 22S- 31S. 6. Schepke, U., Meijer, H.J., Kerijk, W., et al. Digital versus analog complete-arch impressions for single-unit premolar implant crowns: Operating time and patient preference. (2015) J Prosthet Dent. 7. Renne, W., B. Wolf, R., Kessler, K.,et al. Evaluation of the Marginal Fit of CAD/CAM Crowns Fabricated Using Two Different Chairside CAD/CAM Systems on Preparations of Varying Quality. (2015) J EsthetRestor Dent 27(4): 194- 202.